Heppell glass started when William Henry Heppell took over the firm around the middle of the nineteenth century, which had existed from around the beginning of the century. Starting in 1874 he registered twelve designs over the next ten years. Heppell glass produced industrial glass for the collieries, street lights and deck, anchor and masthead lights for ships as well as domestic articles. Their advert in the December 1880 edition of Pottery Gazette also mentions cut & engraved moons, confectionery glass, fancy glass, lenses and lamps for collieries. The ad also says “The special attention of buyers in called to our cut and engraved moons”. though I’m not yet sure what this means! Their banner states they produce “Blown, pressed, flint, opal & Marble glass” so they had a wide repertoire. Perhaps this glasshouse is a more utilitarian producer, concentrating on industrial wares as the mainstay of their business, with “fancy glass” taking a smaller part. This would help explain the small number of designs registered and the limited, if interesting, designs they did produce. Heppell glass is interesting from a collector’s point of view for a range of unusual and quirky designs which they produced. Some of these designs were good but some were less successful. 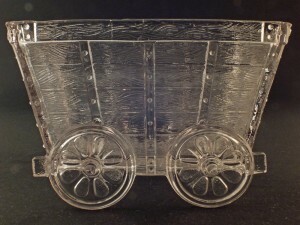 Colliery trucks in various sizes, perhaps to be used as salt cellars or sugar bowls, as the example on the right. A shell form design for milk/cream jug, sugar bowl and butter dish (later produced by Davidson as they bought the moulds once the firm failed). A dolphin design which is thought to be heavy and unattractive. This may be the design on the pictured cream jug here although the three creatures do look like mythical fish so I’m not sure. 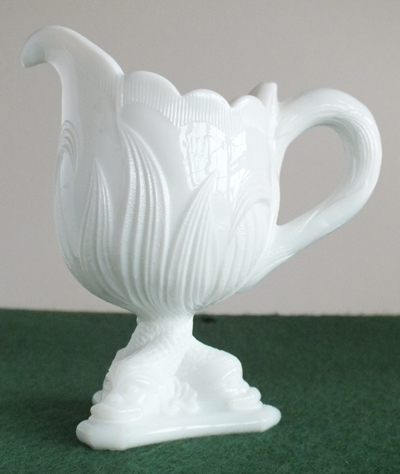 It is not an entirely successful design as the base is heavy and somewhat awkward in relation to upper part of the jug but has its own interest. This design was registered by Heppell on the 24th November 1882 and is featured on page 108 of Colin Lattimore’s book “English 19th Century Press-Moulded Glass“. On checking “The Identification of English Pressed Glass” the design registered on the above date has the words (Dolphin series) on the same line so the pictured piece is likely to be this dolphin design. 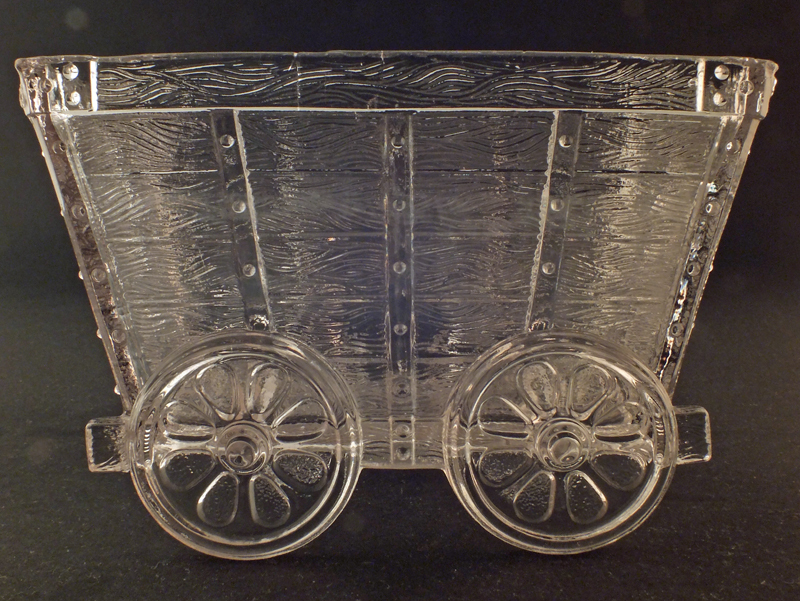 In late 1884 Heppell glass decided to stop trading and George Davidson bought the moulds and patterns and produced some of them, including them in their catalogue.